I have never heard of Tomato Pie but it sounds really good to me. I would probably peel my tomatoes because our skins are tough this year for some reason. We would have had to eat both too. This looks really good. I would likely eat the whole thing myself. I have never eaten tomato pie! It looks yummy! Awesome way to use up tomatoes! Thanks! That sounds yummy! I will have to try this someday! 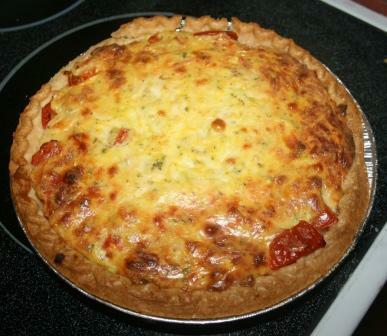 I've been planning to make tomato pie--we ALMOST have enough tomatoes. I'll have to try out your recipe--yum! This is beautiful, and how different! It seems that it would be very filling, too. It is so good to have some meatless meals during the week. Can't wait to try this. I've got to get some more tomatos at the farmer's market first! I have had a ton of garden tomatoes this year! This recipe looks delicious! I made a tomato tart and pasta sauce with the ones I have used so far, I will definitely keep this recipe in mind for the rest of the tomatoes, thanks! I've got a recipe for a parm and basil crust..now I know what else to fill it with. YUM! You amaze me, Lisa. This looks so good! Thank you Lisa! I don't have garden tomatoes. :( But I want to try this anyway. Maybe I can get some Farmer's Market tomatoes so it will taste more authentic.